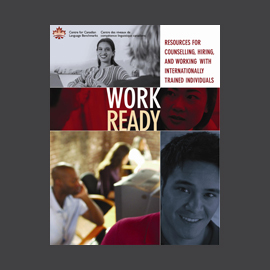 Work Ready: CLB Resources for Counselling, Hiring and Working with Internationally Trained Individuals (ITIs) (also referred to as simply Work Ready) is a collection of language-based tips and resources for employment counsellors and human resource (HR) professionals, to facilitate the successful employment of internationally trained individuals (ITIs). 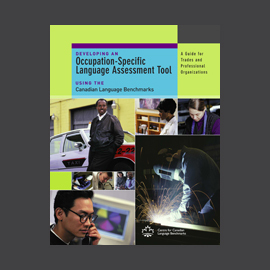 Section I contains general information about Work Ready, the Canadian Language Benchmarks, language assessment and Essential Skills. Section II contains information relevant to counsellors as they work with ITIs in the pre-employment stage. Section III contains information for HR professionals and employers on hiring and retaining ITIs. Section IV contains case studies of employment-based projects where ITIs have received training to help them work successfully in Canada. Section V contains additional resources.